Explore the rich culinary history of New Orleans on a tour that combines a cooking class with a French Quarter cocktail tour. 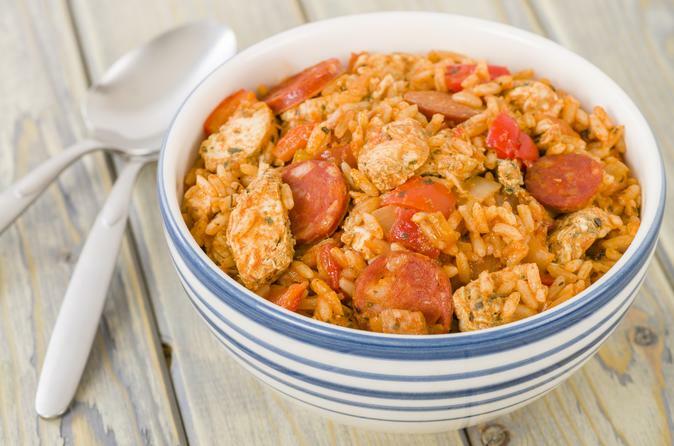 First, learn about the basics of Louisiana cuisine from a professional chef during an entertaining demonstration, then sample classics such as jambalaya, gumbo, and pralines. Afterward, admire the architecture of the French Quarter as you stroll through the neighborhood, stopping in historic bars to sip the Big Easy’s most celebrated cocktails. You'll discover the flavors and culture of New Orleans during this fun and informative tour! Start your food and cocktail tour with a 2-hour cooking demo at the New Orleans School of Cooking. A professional chef prepares classic specialties such as jambalaya, gumbo and pralines while you watch and learn. The class is served with a side of local history that goes into the spices that are essential to Cajun and Creole flavors. The modern-day cuisine of New Orleans opens a window onto the city’s rich cultural history, with its roots in the traditions of French, Spanish, Native American and African cooking. When the class demonstration finishes, snack on generous samples of the dishes, accompanied by complimentary coffee, iced tea and beer. Be sure to take the provided recipe booklet to try making the dishes at home! After your introduction to Cajun and Creole cuisine, stroll through the historic streets of the French Quarter on a cocktail tour with an expert guide. Learn about the origins of Southern Comfort, invented in New Orleans in 1874. The classic Sazerac cocktail goes back even further to 1850! Purchase any of your favorite cocktails during stops at several historic bars. As you walk through the French Quarter, look inside the city’s oldest restaurant to see its wine cellar and private dining rooms, where some of the most important deals in New Orleans were hatched. Examine the Spanish and French-inspired colonial architecture as your guide shares fascinating stories about the world-famous neighborhood, including the bars and cocktails created here. After a fun and fascinating 4-hour cooking class and cocktail tour, return to your starting point in the early evening to end your tour. Please note: Participants do not cook during the culinary demo.